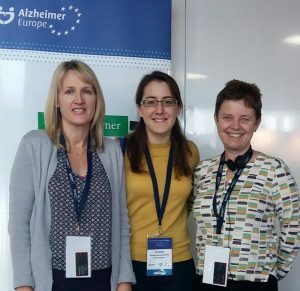 Prof Jane Murphy, Dr Michele Board and Yolanda Barrado-Martín attended the 28thAlzheimer Europe Conference (29th to 31st October 2018). 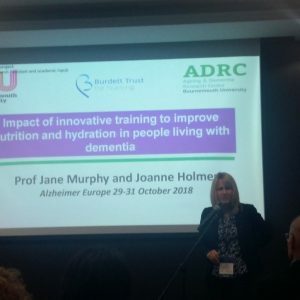 Jane presented a paper on her nutrition research ‘Innovative training to improve nutrition and hydration in people living with dementia’. 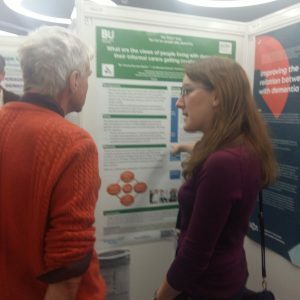 Dr Michele Board presented a poster ‘Evaluating the impact of the virtual reality app “A walk through dementia” on students learning and practice’ centred on her research funded by Alzheimer’s Research UK. Whilst Yolanda presented a poster ‘What are the views of people living with dementia and their informal carers getting involved in Tai Chi?’ based on the findings from her PhD project which forms part of the TACIT Trial.